In July 1941, the Nazi invaders occupied the city of Smolensk and the surrounding cities. Despite the severe regime, established by the Nazis in the occupied territory, the Smolensk citizens didn’t bow to the enemy, and took the road of partisan warfare against the invaders. In the autumn of 1941 in the Smolensk city and its suburbs, there appeared 4 clandestine organizations and more than 30 patriotic groups. Together with the old patriots, in clandestine partisan struggle also took part the youth. When they recognized, that the war began, many boys and girls, despite their young age, went to the clandestine groups. However, they knew that if they’ve been caught, it would be a terrible end for them — unbearable suffering and brutal torture, which the Nazi executioners tried to «give a loose to the tongues » to their victims. Moreover, the same fate could befall their family. It was necessary to have the courage and not the children’s courage to go for it consciously. Thr sisters Luba, Varvara and Luda Goevs were twelve, thirteen and sixteen years old when the most difficult test of their lives happened: the war came. The girls were involved in a clandestine organization that operated from 1941 in the Smolensk city region, called Rachevka, under the control, made by railway-engineer P.E. Lapkovsky. The house where they lived with their mother Matrona, who also was a member of this clandestine organization had a basement, where there was a typewriter with the German text. They produced documents for free movement around the city in it, with the help of the anti-Hitler leaflets, printed by the vitreograph under the fictitious documents, got products from Germans and passed them to partisans. The youth clandestine was active: they cut the enemy’s telephone lines, distributed leaflets, the partisans carried out assignments for prospecting military facilities. Time left indelible marks on us. Each generation bears the seal of the age. One generation fought, the other — recovered the cities, the third — raised virgin lands. What’s the youth now? «Grown-up» young clandestine fighter childhood was filled with such tests that they were difficult to be imaged even by a great writer, it was hard to believe. And it was the enthusiasm, faith in bright ideals, hating of enemies and love for the Motherland. And what are the ideals of today’s pupils? 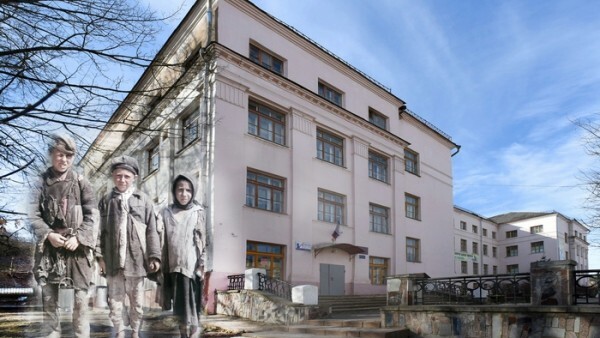 The 1st Secondary School Building, where studied Smolensk members of the clandestine E. Shpakovsky, V. Vlasov, L. Goeva, who died in 1942 (Smolensk, Sobolev Street, 24), is the object of cultural heritage of regional significance. The school was constructed by a standard project-speed method. Young members of the clandestine were the first students of the school in 1940-41.